Many factors combined during the 2013-14 deer hunting seasons to produce a total harvest decline of 18.4 percent from the 2012-13 seasons. Erik Bartholomew, big game biologist for the Wildlife Department, said the total deer harvest was 88,009. This compares to the 107,848 deer that were taken by hunters in 2012-13. The deer harvest numbers from 2013-14 will be included in this year's Big Game Report, which will appear in the September/October issue of "Outdoor Oklahoma" magazine, published by the Oklahoma Department of Wildlife Conservation. "It was a compounding of factors that contributed to an overall lower harvest," Bartholomew said. 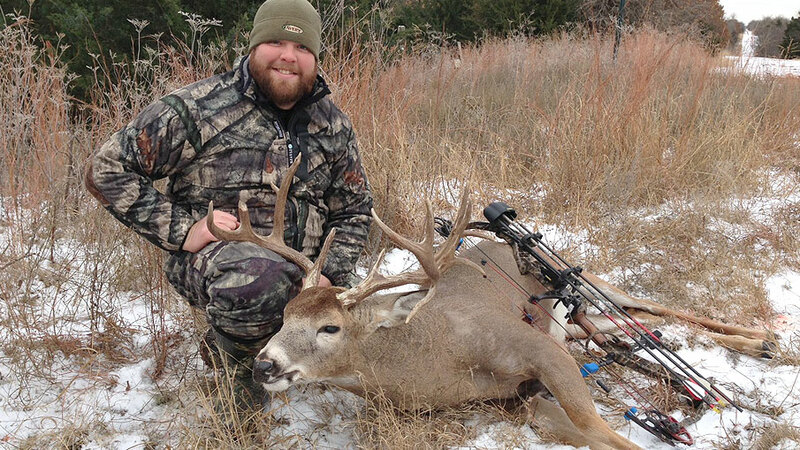 Oklahoma offers three major types of deer hunting seasons: archery, muzzleloader and gun. Harvest numbers for each of those seasons declined from the previous year, based on data gathered from reports to Oklahoma's online E-Check system. A total of 52,197 bucks (59.3 percent) and 35,812 (40.7 percent) does were harvested in 2013-14. The largest decline was seen for the muzzleloader season. This year, muzzleloader hunters took 14,981 deer, which is down 6,624 animals (30.7 percent) from the muzzleloader harvest of 2012-13. The gun season harvest was 51,588, down 11,447 animals (18.2 percent), while archery hunters took 21,440 deer, down 1,768 deer (7.6 percent) this year from the previous year. "We know that 2011 and 2012 were particularly bad recruitment years for reproduction due to widespread drought across the state," Bartholomew said. So, the deer population was likely lower overall ahead of the 2013-14 deer seasons. A comparatively mild and wet summer in 2013 produced more food and cover options heading into fall, which effectively distributed the deer population more throughout the landscape. "The deer were less concentrated because food and water was more widely available as compared to previous years. In many parts of the state, there was a bumper acorn crop. So, it's no wonder that deer weren't visiting corn feeders or food plots," he said. In most of the state, much denser foliage and taller grass growth brought on by milder and wetter conditions also hindered hunters' ability to sight deer in the field. Bartholomew said the weather also played a part in reducing the deer harvest. The gun season was affected by two major winter storm events over its 16-day run, along with several days of heavy fog in many areas of the state. Significant winter weather also affected the opening few days of the holiday antlerless season. For a comprehensive look at the 2013-14 big game hunting seasons, including tables showing deer harvest numbers broken down by specific county and wildlife management area, be sure to read the annual Big Game Report in "Outdoor Oklahoma." This full-color, award-winning magazine brings readers the latest news on wildlife, the outdoors and conservation throughout the state. At only $25 for three full years, "Outdoor Oklahoma" is also among the best magazine values around. To subscribe, call (800) 777-0019 or go to tinyurl.com/OutdoorOklahoma. The 2013-14 season was the first that required all deer hunters to report their harvests online using the Wildlife Department's E-Check system at wildlifedepartment.com. The online E-Check system offers hunters a more convenient way to report their harvests of deer, elk and turkey. No longer are hunters required to travel to a physical check station during business hours to report their harvests. E-Check aids biologists and game wardens, who can access current harvest information to help them better manage wildlife. The 2013-14 deer seasons were the first seasons held after the Wildlife Department rolled out a new deer hunter education initiative, "Hunters in the Know ... Let Young Bucks Grow!" The focus of the campaign is to encourage hunters to consider harvesting an older buck as a way to positively influence the age structure of the state's deer herd.